Microsoft PowerPoint 2010 is the most loved presentation maker, its features are so rich and beyond comparison. PowerPoint 2010 built in templates are elegant, ready and easy to use. Its transition prowess are really amazing. How about its animations? Your presentation is of no use without it.Luckily, it’s not just present in Microsoft office 2010 but it is fully loaded. There are so many add inns in this version compared to its predecessor, one of it is you can translate a word or group of words in “review” tab by its mini translator. 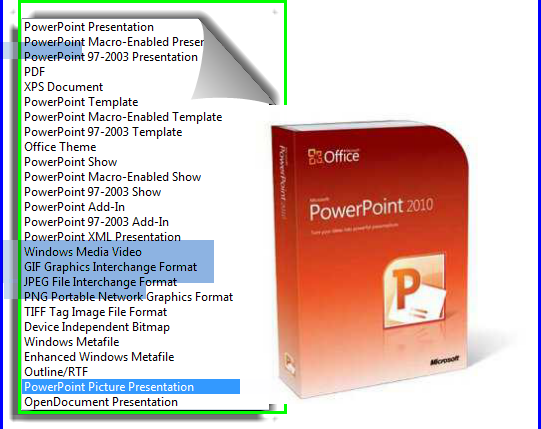 In terms of features and use of Powerpoint 2010, we can talk about it till a week if we discuss it by details. Do you know that we oftentimes overlook its other useful features? 1. It can convert your presentation (pptx) to jpeg (common image format) file. 2. It can change your presentation (pptx) to gif (animated image). 3. It can turn your presentation (pptx) to png (graphics image). 4.It can transform your presentation (pptx) to pdf (portable document format). 5. It can create your presentation (pptx) to more files like video and etc. Simple and easy it is just a matter or (3) three clicks. First go to your file menu, at the upper left. Then choose “save us” and in the “save us type” select the file you want your presentation to be saved. This is not new but most of the time we miss this simple yet useful elements of Powerpoint 2010 that sometime cost us in buying another program for conversion use. What we do not know? It’s already pre-built, in Microsoft Powerpoint.